This visit framed in the Walk Into Bar joke format. Two things: the location; and the goofy dispute over the meaning of the initialism B.L.T. 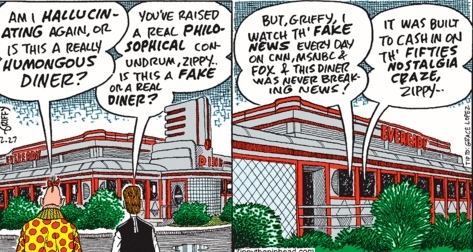 In general, the diners in these strips have no special relationship — via their names, themes, or locations — to the topic of discussion: they’re just places for Zippy and Griffy to exchange opinions. This particular place is The Hollywood in Dover DE, and Zippy and Griffy have been there at least twice before. Happy Donuts at 3916 El Camino Real, in the Barron Park neighborhood of Palo Alto, just south of the Stanford Industrial Park, itself just south of the College Terrace neighborhood (on the west) and the California Avenue shopping district (on the east), these being just south of the university (on the west) and downtown Palo Alto and the Professorville and Old Palo Alto neighborhoods (on the east). My neighborhoods.